Unisport Uncut is back, this time with a bit of a Special Edition and there are several reasons why this episode stands out. First things first the number of hosts has doubled from two to four. Jakob and Joltter had visitors from Germany, when Danie and Konzi, Freekickerz joined the show. They helped announce the winners of our 100.000 subscribers’ competition give away. Watch along. When the boys from Freekickerz in 2007 began filming their freekicks, they probably didn’t expect to become world famous. None the less their freekick skills have taken the world by storm and we therefore thought “Why not invite them to Denmark” and so we did! Their visit brought with it this very special episode of Unisport Uncut, which among other things also provided a good chance to announce the winners of our give away that we made in connection with hitting 100.000 subscribers on Youtube. Watch the video and see who won the spoils. 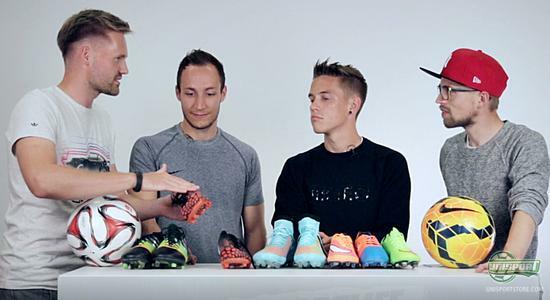 On top of that there was plenty of room for good chit chat, with questions like how Freekickerz came to be, why it’s spelt with the letter Z, why Konzi supports Dortmund and which boot was Danies favourite before he fell for the Nike Mercurial Vapor. 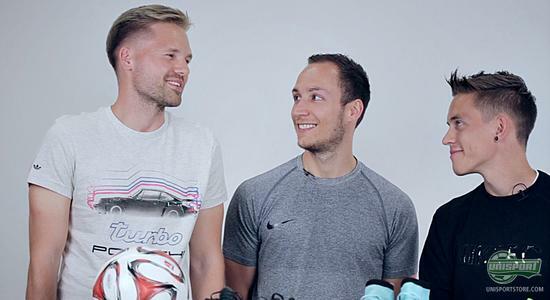 Danie and Konzi were happy to help Jakob and Joltter with this special episode of Unisport Uncut. Maybe it’s sparked a trend, with more video of Freekickerz and Unisport together. What video would you like to see with Freekickerz, Joltter and JayMike?